The University of Nebraska Extension and MidPlains Ag in Elgin, Nebraska are collaborating on a Technologies for Irrigation Management Field Day near Elgin on Thursday, September 8. 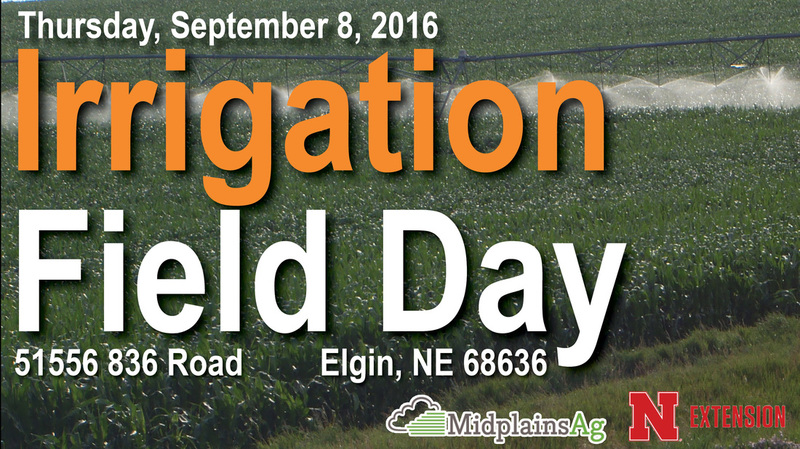 The field day will be held at the Rich Uhrenholdt farm located 3 miles south and 5.5 miles west of Elgin. Registration begins at 8:30 a.m. with presentations beginning at 9 a.m. Among the topics are how to develop management zone maps, soil water sensor technologies, use of variable frequency drives for energy conservation, available incentives for implementing new technologies and the latest long term weather forecast for the region. University of Nebraska Dean of Extension Chuck Hibberd will be the keynote speaker on how Nebraska Extension can assist producers with implementation of irrigation water management tools. Demonstrations will include a discussions of the field research under way, soil water sensor installations, use of drones for field data collection and electric power safety. ​A noon meal will be provided as a fundraiser by the Elgin FFA club. More than 25 companies will be on hand to display and discuss products for use in improving irrigation water management. For more on the event or to view the full agenda, please visit www.cropwatch.unl.edu or www.midplainsag.com/field-day.